Sea of Thieves released one month ago, offering a massive ocean playground for cool player stories along with a frustrating lack of activities and grindy progression. 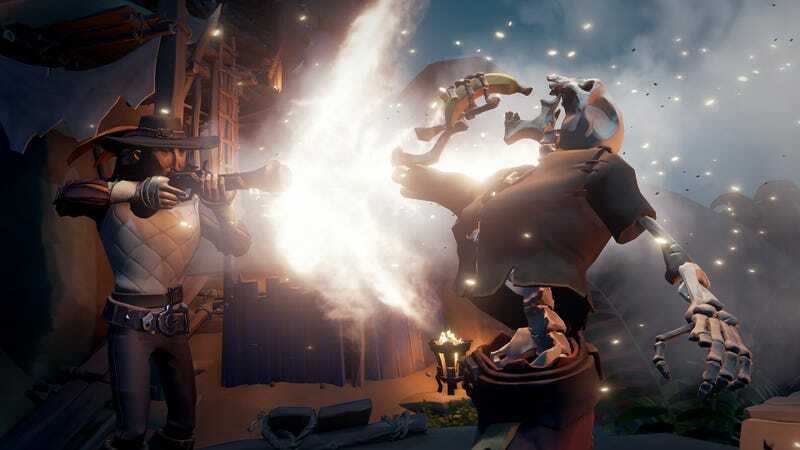 Developer Rare has outlined new content plans for the future, but even without fancy new ships or expansions, the story of Sea of Thieves has as many ups and downs as the sea itself. At launch, servers are remarkably unstable and pirates fight lag as much as they fight skeletons. Many players couldn’t access the game at all, encountering errors with codes like CinnamonBeard and BronzeBeard. The developers released a blog on the 21st outlining numerous issues they intended to fix. This required numerous maintenance periods, including down time on March 22, 24 and 27th. On March 26th, a controversial ‘death tax’ is canceled after players respond negatively. The tax, which proposed a small fee of gold when players died, did not sit well with many players in the community. “Punishing death is the worst idea anybody can come up with,” one player said on the official forums. Rare listened to community feedback and cancelled the change. On March 27th, Sea of Thieves receives its first post release patch. The patch mainly focused on performance improvements. Lag and rubberbanding are reduced. Things are still choppy, but glitch fixes solved issues such as players randomly losing items or finding chests that are that are impossible to pick up. A wave of hackers hits the game on March 29th, using tools like aimbots and loot locating cheats to terrorize other ships and find shiny trinkets. Their presence wasn’t overwhelming, but hacker crews still roam the seas to this day. On that same day, Twitch streamer Prod1gyX becomes the first Pirate Legend, achieving maximum rank with all the in-game factions. He did this with help from his audience, who gathered treasure for him to turn in. The tactic is controversial, and some players refused to acknowledge him as a proper Pirate Legend, going as far as to start the hashtag #NotMyPirateLegend. On April 2nd, player SniperNamedG becomes the second Pirate Legend after streaming 21 hours straight to finish the deed. Some in the community treat him as the first “legitimate” Pirate Legend. On April 4th, a patch tweaks ship respawn times. Now, ships respawn further away from the ship that sank them. This helps cut down on endless ship battles and prevents griefers from blowing up your sloop all the damn time. Meanwhile, players won’t stop “insta-brigging” each other, locking hapless crewmates into the ship’s prison and refusing to release them. On April 12th, Rare finally reveals its plans for future content. This eased the growing sentiment that Sea of Thieves is “No Man’s Sea.” The plans include adding new enemies in May, including some kind of large threat that requires cooperative play, and the addition of new ships in the summer. Rare didn’t, however, give more specifics. On April 18th, a new patch adds ship customization and rewards for Pirate Legends. It doesn’t quite make up for the initially anti-climatic rewards for becoming a legend, but it’s the first step on a journey to give dedicated players some cool goodies. And that’s where things are at. Sea of Thieves might not completely outrun the perception that it’s a content light pseudo-beta, but Rare’s shown a willingness to listen to their community, canceling controversial plans and implementing new rewards for hard-working pirates. At the same time, the game’s fascinating community creates controversies and stories of their own, from dueling Pirate Legends to the ethics of tossing someone in the brig. The game can only grow from here; the question moving forward will be if it’s enough to keep players sailing for the long haul.